The Apex 90 is a brand new addition to the LidgetCompton range. It differs from the normal apex models as the roof has been spun 90 degrees giving the same aspect from both the front and back. This new and unique roof comes complete with plastisol coated, galvanised steel tile effect roof sheets available in 4 stylish colours all with anti-condensation lining, these are then mounted on robust steel purlins and rafters. Each Apex 90 comes with many maintenance free features including PVCu fascia's, windows and gutters. A wide range of optional extras such as personnel doors and roller shutter doors are available are allowing you customise your garage to your exact requirements. 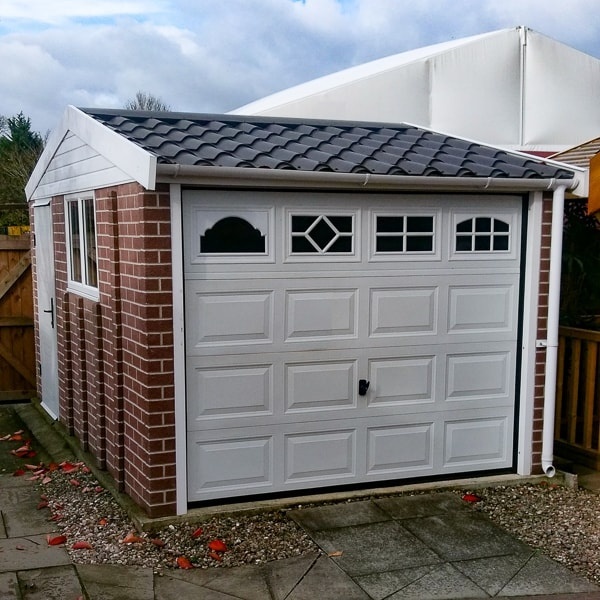 You can even upgrade to a brick, stone or textured finish to match your garage to your existing property. The opportunity to enhance your building with a Premium Options (PO) package deal also enables you to save money and time! The full range of Bespoke Options ensures that you will be able to create the right building for you. Why not talk to us and get expert advice? We've put together the most popular building options and reduced the price. You will still qualify for any future price promotion and discounts! This Apex 90 which is on show at our Wychbold display centre, showcases the many options you can have in the Apex 90 range. The wall finish has been upgraded to the 'Brown' Brick Effect finish - one of four colour brick effects to choose from. A white sectional door has replaced the horizontally ribbed up and over door. The 4 different window styles in the sectional door is there to represent the choices in window style you have with a sectional door. A personnel side door has also been added for alternative access. 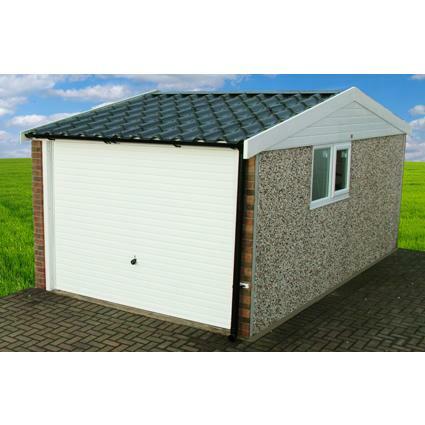 Shown here is the LidgetCompton Apex 90 single garage. 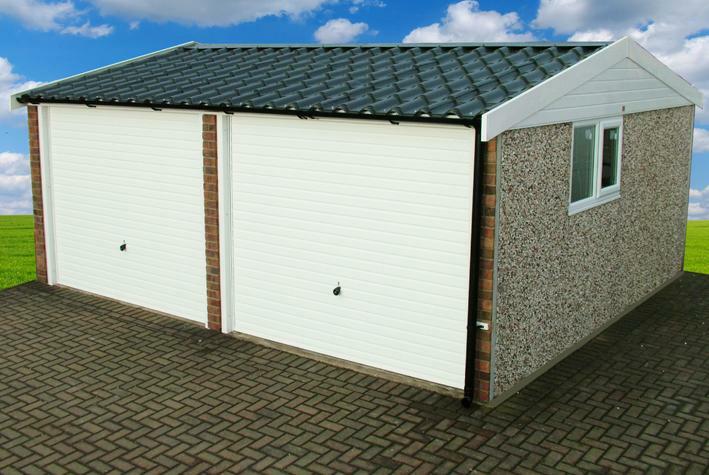 Shown here is the LidgetCompton Apex 90 Double Garage. 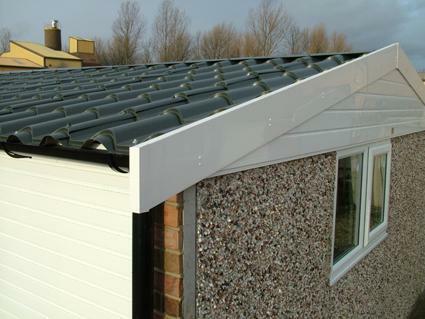 This image shows a close-up of the transverse roof design on the LidgetCompton Apex 90 garage. All concrete garages include installation by an expert team of builders. A concrete base needs to be prepared by you prior to delivery. Base plans for each building and base-building information is available, to ensure that there are no issues when we deliver and install. As all of our concrete garages are very heavy, they are normally delivered using large lorries. So that we can be sure that buildings are safe and undamaged when unloaded, we also use lorry-mounted fork-lifts to manoeuvre the concrete panels. To be able to do this, we will need to ask you questions relating to access and the size of lorry that will be able to reach your property. Once you have placed your order, you will be asked to fill out a 'help-the-driver' form that will give you the opportunity to give as much detail as possible - allowing us to deliver and install your new garage. As there are so many variations in our range of garages and each one is made to order, you should expect to receive delivery of your new building around 4-6 weeks from when your “help the driver” form has been sent back to us. Where Can I See LidgetCompton Garages?